Henry Glintenkamp, "Cuban Workers Club", 1937. Oil on canvas. Chrysler Collection. The Club Julio A. Mella in Spanish Harlem was named after the founder of Cuba’s Communist party. 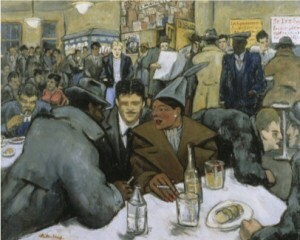 The exhibition “Nueva York: 1613 – 1945″ (New-York Historical Society and Museo del Barrio), featured the original of this painting of that club by Henry Glintenkamp, as part of the exhibition’s final section. In this closing sequence of the recently closed show, the curators demonstrated how the Spanish Civil War brought together many of the strands of the centuries-long story of Spanish-speakers in New York. 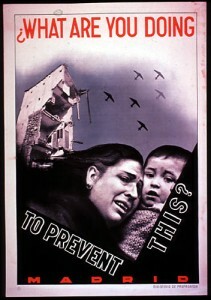 As evidence of this confluence, in this painting of a Cuban workers club, situated in a predominantly Puerto Rican neighborhood in New York, one can clearly see on the back wall a painterly rendition of the “What Are You Doing to Prevent This?” poster, below a banner announcing El Machete, the newspaper of the Mexican communist party.